Yep! You read right! This is a review. Meaning, I’ve finished a book. My first of 2015. *Sigh* I’m slowly finding my groove in this new year, but I won’t say I’ve mastered it yet. According to my written goals, I need to finish two more in the next 7 days. But I digress . 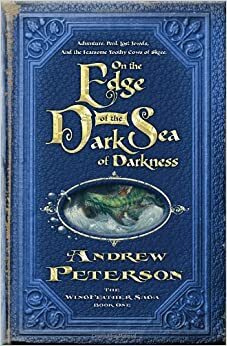 . .
On the Edge of the Dark Sea of Darkness by Andrew Peterson. A Christmas present that I was thoroughly excited about! You have all heard me talk about Andrew Peterson’s music before. We love his music because he is such a good story-teller. Well, that skill has transferred beautifully to writing! Little did the Igiby children know, their encounter with Slarb and his cohort of Fangs would trigger a chain of events that would reveal some surprising secrets, set them on a path towards learning more about the history of the legendary island of Anniera, and send them on an adventure outside of the town limits of Glipwood. The Jewels of Anniera . . . will they be protected, or will Gnag the Nameless get a hold of them? Glipwood and its residents . . . will they survive? Peet the Sock Man . . . who is he, and really . . . why the socks? I promise you will be intrigued by this book! I will say honestly that I was a bit surprised with how intense some of the scary scenes were, but they are not night-mare inducing, in my opinion, just a tad bit violent [like a few scenes with mass slaying of bad guys!] I, as an adult, had the feeling a few times that some of the conflicts repeated themselves more than they ought to have, but then I reminded myself that a little boy would probably think that was the coolest thing ever. Morally, there was nothing questionable in this book, and though the first book did not offer up major discussion points related to the Gospel, I have an inkling that that may be coming in future books. Already there are hints, or shadows, of a country that is much better than they one where they live, concepts of responsibility and longing, and many opportunities to talk about obedience and respect. So, in case it has not yet been clear, I would highly recommend this book! It was a very fun read, and I am already a few chapters in to “North, or Be Eaten!” (Book 2). Have you read the Wingfeather Saga series? Would you like to? What are your thoughts? Let me know in the comments below!